Despite urgent warnings of the need to bolster the U.S. Coast Guard's ailing polar icebreaker fleet - now just a single functional 42-year-old vessel - some Republicans in Congress have proposed diverting $750 million planned for a new ship to President Donald Trump's long-promised border wall. The Coast Guard currently has one working heavy icebreaker ship, the Polar Star, that's been in service since 1976 - well past its intended 30-year service life. Due to worn-out electric motors and other problems, the Coast Guard placed the ship in "caretaker" status in 2006. It was later reactivated in 2012 after requiring nearly $60 million in repairs, according to the Congressional Research Service. "We need six icebreakers, three of them need to be heavy icebreakers, and we really need one today," Adm. Karl L. Schultz, the new commandant of the U.S. Coast Guard, said at an event in Washington last week. 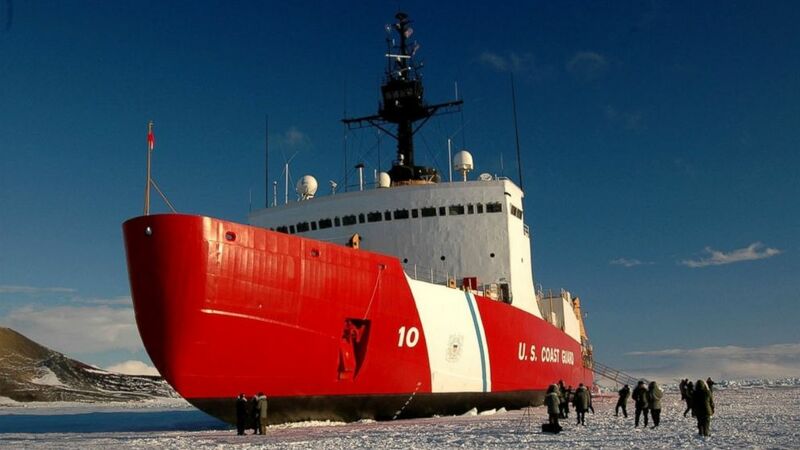 "There's still a lot of interest in getting an icebreaker to replace our 40-plus-year-old Polar Star, which is the only heavy icebreaker in the U.S. arsenal," he said. "We need that ship now." The Coast Guard, under the authority of the Department of Homeland Security, requested $750 million in its annual budget that would go towards a new ship that would be ready for service by 2023, when the Guard expects to retire the Polar Star. Even Trump himself promised a new ship while at a Guard change-of-command ceremony in June. "One of the first times I met the Admiral, last year, I asked him, "What do you need?" He replied, "Sir, we need icebreakers, and we need them badly." Well, now, you're getting them," Trump said. "And, to be specific, I'm pleased to report that the Coast Guard is now on course to receive its first new heavy icebreaker in more than 40 years, and plenty other ships and boats and equipment and everything you need," he went on. But House Republicans, led by House Appropriations Committee Chairman Rodney P. Frelinghuysen, instead opted to strip funding for the new ship from its proposed 2019 House budget bill and reallocated the funds that would go towards the planned border wall at the US-Mexico border. A spokesperson for Frelinghuysen has not responded to ABC News' request for comment. Democrats, in a letter sent to Frelinghuysen last month, slammed Republicans for "wasting a staggering $4.9 billion on a border wall" and called on the chairman to reconsider the "misallocation of resources" amid heightened tensions with Russia, who is so far dominating the Arctic space. "We urge you in the strongest possible terms to reconsider the misallocation of resources, which would undermine all 11 of the Coast Guard's statutory missions and place our nation at a distinct economic, geopolitical and national security disadvantage for decades to come," the letter said. The Arctic region is believed to hold an estimated 13 percent of the world's untapped oil reserves, 30 percent of its natural gas and vast mineral resources, according to U.S. Geological Survey estimates. With sea ice declining, largely due to global warming, valuable waterways in the Arctic are now accessible with the use of polar icebreaker ships that can power through thick ice with specially angled bows and reinforced hulls designed for open-water icebreaking. Among Russia's booming arsenal of tools: nearly 50 polar icebreaker ships that can tear through large chunks of ice, making it easier to access those resources, according to the Congressional Research Office. "Russia has claimed natural resources and territory in the Arctic that exceed its internationally recognized rights, and is making investments in its ice-capable military assets to back those claims," several Democratic lawmakers wrote in the letter. In the past few years, Russia has invested heavily in building up its military presence in the Arctic, constructing new bases, refurbishing Soviet-era ones and designing communications infrastructure. China is also not far behind. Earlier this year, China outlined ambitions to extend President Xi Jinping's signature Belt and Road Initiative to the Arctic by developing shipping lanes opened up by global warming. While the Chinese icebreaker fleet is even smaller than the US', Beijing recently started the bidding process to build its own nuclear-powered icebreaker, even though China has no territorial rights to the Arctic region. In the letter, the Democrats said the U.S. is "woefully unprepared for the reality of rising global temperatures and melting sea ice." "Certainly America's got to up its game in the Arctic. There's no doubt about that," Defense Secretary James Mattis expressed to reporters in Alaska ahead of a trip to Asia in June. The Department of Homeland Security told ABC News that the department goes under "a routine process to assess the resource execution of programs" and that Congress has given DHS the authority to reallocate funds, but only after the budget is passed by Congress and signed by the president. "As a part of this process, the Department evaluates the need to reallocate funds and does so in a manner to minimize the impact on its operations and mission execution to the maximum extent possible," DHS spokesperson Lesley Fulop told ABC News in a statement. A spokesperson for the House Appropriations Committee has not responded to ABC News' request for comment. The absence of funding for a new ship in the House's Republican-led budget bill was met with criticism from their counterparts in the Senate, who have included the $750 million in their version of the budget bill. "In our Homeland Security FY19 Appropriations bill here in the Senate, we included funding to fully build our first polar strength icebreaker in almost fifty years. It is exceedingly unfortunate that the House does not recognize the sense of urgency, as we deal with Arctic priorities," Sen. Lisa Murkowski, R-Alaska, told ABC News in a statement. But the lack of funding for a new icebreaker ship is not a done deal. Both the House and Senate versions of the budget must still pass out of their respective chambers, and then the bill would go to conference, where the differences between the two bills will be ironed out. A source familiar with the budget process told ABC News that the committee's decision to divert the funds to the border wall is likely a "political tactic" meant to appease the president in his quest to build his coveted border wall. "I think it's hard not to see how the pressure from the president isn't playing into that," the source told ABC News. The source said that while committees make tactical moves in bills "all the time," this one "happens to be a really big one." It's possible the $750 million is eventually reallocated back to the polar icebreaker ship, the source said. As for the president's proposed budget wall, a report by the Government Accountability Office released Friday warned that DHS has not provided a complete analysis required to efficiently build the barrier along the US-Mexico border. "DHS plans to spend billions of dollars developing and deploying new barriers along the southwest border," the study said. "However, by proceeding without key information on cost, acquisition baselines, and the contributions of previous barrier and technology deployments, DHS faces an increased risk that the Border Wall System Program will cost more than projected, take longer than planned, or not fully perform as expected." ABC News' Serena Marshall and Elizabeth McLaughlin contributed to this report.